Show Your Love with Anatomical Heart Dipped Strawberries! 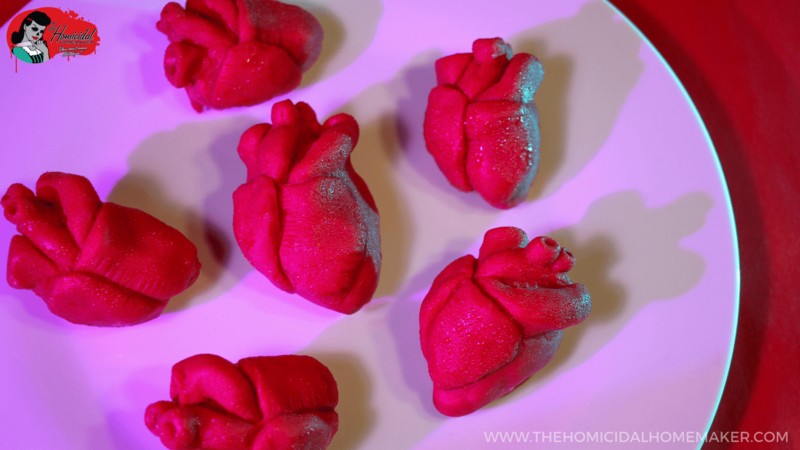 This Valentine’s Day, profess your love the only way a horror fan can: by giving your heart to the special ghoul in your life…or at least a batch of these anatomical heart dipped strawberries! With a juicy strawberry lurking beneath a shell of sweet candy arteries, your bloody Valentine will surely be impressed with this gory twist on a traditional Valentine’s Day treat. Despite how you may feel about the holiday, we can all agree that the ultimate way to celebrate is with a blood-soaked bite to eat, and one of your favorite horror flicks. Get this recipe in issue #180 (Jan/Feb 2018) of Rue Morgue Magazine, available on newstands now! In a microwave-safe bowl, melt candy melts in 30-second intervals, stirring in between each interval. Stir until completely smooth. Add in the corn syrup, and stir just until combined; it’s important not to overmix! Pour mixture out onto parchment paper, and flatten into a disc-shape with a spatula. Allow to cool at room temperature for at least one hour. In another microwave-safe bowl, melt the other bag of candy melts. Wash and dry strawberries. Carefully remove the stem from each strawberry. Using a skewer or toothpick, dip each strawberry into the candy melts, making sure the entire strawberry is coated. Set on parchment paper until hardened. Break off a small piece of the candy clay, and knead with your hands until softened and pliable. Form small tubes for the aorta, veins, and arteries, using your fondant sculpting tools to blend the edges and add details. Add more candy clay on top to form the atriums and ventricles. Mix a 2:1 ratio of vodka to light corn syrup. Mix well, and brush on top to add a dewy, wet look to the finished strawberries. Allow to dry completely. Chill in refrigerator until ready to serve. Berries are best when enjoyed within 1-2 days of preparation. © Copyright 2010-2018 The Homicidal Homemaker® - All rights reserved. No content may be redistributed, copied, or modified without express written permission. No recipe or tutorial may be used for profit or any other commercial use. 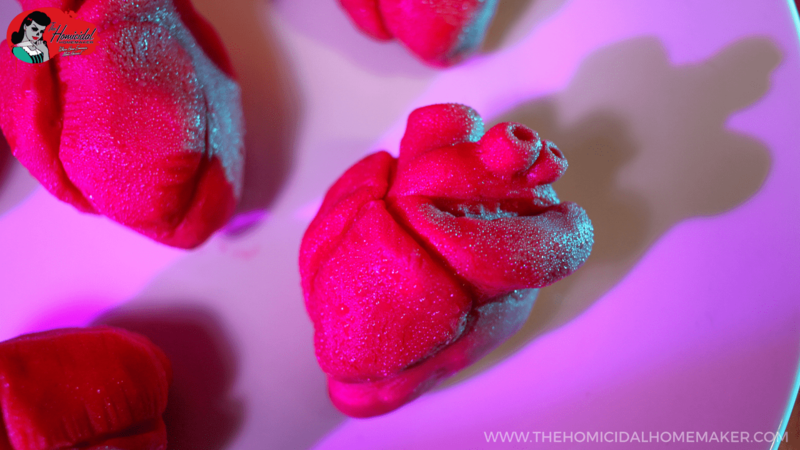 If you loved these Anatomical Heart Dipped Strawberries, be sure to check out my other Rue Morgue Magazine exclusive recipes, and my YouTube channel for more fun episodes of my horror cooking show, tutorials, cocktails and much more! And if you’ve created something using one of my recipes, don’t forget to tag me on Twitter or Instagram & use the hashtag #HomicidalHomemaker for a chance to be featured! Next articleGive Easter an Undead Twist with Boozy Zombie Bunny Marshmallows! Thank you, Ellen! I hope you give them a try, and if you do, please be sure to tag me in your photos! I’d love to see!